As we head into the final quarter of 2018 we have to wonder what the state of the real estate market will be in 2019. Median sales prices for single family homes have risen since the bottom of the market in most of the major markets in the country and certainly in our feeder markets of the upper Midwest and California. As demonstrated by the graph below for the Rimrock/Lake Montezuma area the median sales price for all the markets in the Verde Valley for all intents and purposes are at or near their all-time highs. The median sales price for the Sedona area is at $555,000, Cottonwood at $257,000, and Camp Verde at $243,000. The question that keeps coming up is how much higher can prices go before resistance is met. As long as our feeder markets remain strong with prices rising in those markets, our market in the Verde Valley can absorb higher prices. After all, as my Uncle used to say “the buyers are just trading $10,000 cats around”. They are selling for higher prices so they can afford to pay more when they buy. Our feeder markets rely more on typical market forces than our market does. Our market is driven by buyers coming to the Verde Valley generally with a substantial amount of cash. Most typical markets start out with first time home buyers buying starter homes and those sellers moving up until some of them move out to Arizona or Florida or other retirement markets. Those markets have a lot more dependence on average incomes and interest rates. If incomes do not rise to keep pace with in the increase in home prices and higher interest rates a slowdown could be on the horizon. Another factor that could have an impact on our markets is the number of buyers in the last two years that have bought homes on the strength of the short-term rental market. If those buyers become disheartened with their short-term rental incomes we could see some of those homes come back on the market. At some point the short-term rental market is going to become saturated. I for one see the short-term rental market as having a serious detrimental effect on the Sedona community. It has driven most of our workforce out of Sedona and it is having an impact on our school district with the loss of students, and teachers. Both of these factors area are having a negative overall impact on our town. Sedona area: The median price of a single-family home rose 7% in the last 12-month period to a median sales price of $555,000, its highest point since the same time period in 2006-07. Residential inventory continues to be in short supply with 306 residential units available at the time of this writing. The number of single-family transactions in the last 12 months was up 13% over the previous 12-month period further adding to the short supply. The median sales price for the first nine months also came in at $555,000 up 16.7% over the first 9 months of 2017, with strong sales for the first 9 months at 405 sales up 7% over 2017. The median sales price of a single-family home in the last 24-month period has increased $90,000, just under 20% for the two-year period. Vacant land transactions year over year showed a solid gain up to 162 sales, 12.5% over the same period a year ago, and the highest number of sales since 2004-05. The median sales price for the last 12-month period came in at $147,500 an increase of 4.4% over the same time period a year ago. The supply of vacant land in the Sedona area has remained steady in the 300 range. 80% of the sales year to date 2018 have been below $300,000 with the sweet spot for sales in the $100,000 to $200,000 range. The Sedona area luxury market, prices over $1,000,000, came in at 48 sales in the last 12-month period, its highest number since the same period in 2006-07 and a 23% increase over a year ago. Inventory in the luxury market is seeing a jump with 88 homes over a $1,000,000 on the market at the time of this writing up about 25% from where it has been for several years. The segment of the market over $2.5 million remains very challenging for those sellers with 1 sale year to date 2018 and 17 homes on the market at in that price range. The median sales price for Condos and Townhomes in the Sedona area for the last 12 months came in at $287,750 a 3% increase over 2017. The number of transactions for the last 12-month period came in at 124 up 3%. Cumulative days on the market came in at 89 days down 12% from the same time period a year ago, the lowest days on market in the last 12 years. This low time on market is a reflection of the short supply of homes for sale and the increased number of sales. This is a key indicator of future market performance. 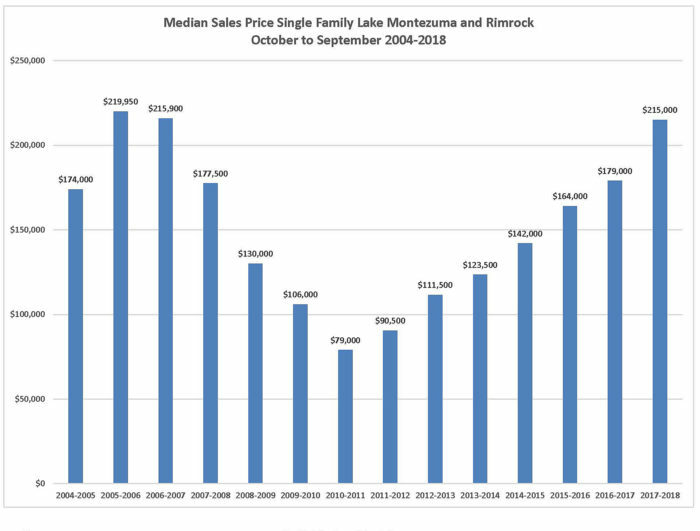 The median sales price for single family homes in the Rimrock and Lake Montezuma area for the last 12-month period came in at $215,000 up 20% from a year ago and effectively the highest median sales price ever. The number of sales remained steady at 73 sales for the last 12-month period. The median sales price for single family homes in the Cottonwood and Cornville area for the last 12 months came in at $257,000 up 4.8% from a year ago. The number transactions came in at 563 sales for the last 12 months up 3.8% from the previous 12 months. Again, this is effectively the highest median sales price ever recorded for this area. The Bottom Line: Prices are at all-time highs, inventory is in short supply, the overall economy is strong, our feeder markets are strong. There is still a nationwide housing shortage. The market this fall will still benefit sellers more than buyers and looks the same for the first quarter of 2019.